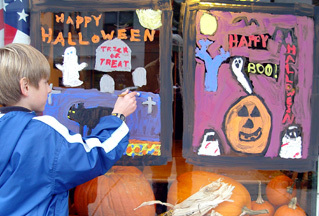 Many residents strolled The Boulevard during late-October where local businesses in conjunction with the three grammar school PTAs sponsored the 10th Annual Halloween Window Painting Contest. 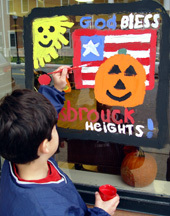 Over 300 3rd, 4th and 5th grade students paint a Halloween theme illustration on a space provided by Boulevard businesses. 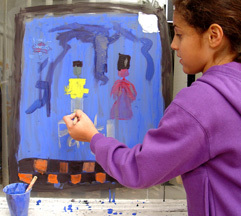 Graphics were judged upon originality and artistic expression. Winners from each grade received 1st, 2nd and 3rd Place Ribbons. All participants received ribbons. PTA chairs: Laura French (Lincoln) and Cheryl Cutruzzula & Cindy Stinson (Euclid).